Weddings are one of the most important times in a person’s life. This is the moment you realize you’ll be spending the rest of your life with the person you love. Making sure this ceremony goes off perfectly becomes paramount if you want to make an occasion your friends and family will remember. 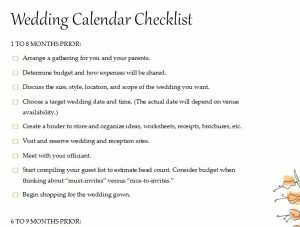 The Calendar Wedding Checklist gives you the power to take action during the periods of your wedding planning downtime to access of certain goals have been met. Planning a wedding often takes months. You need a convenient way to check off the important milestones of wedding planning during this time. 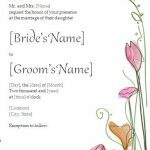 The Wedding Checklist does just that by giving you a simple and straightforward Word document to customize for your special day. 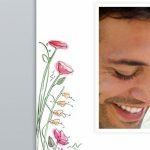 After downloading the template file to your computer, you’ll be free to start customizing the page. 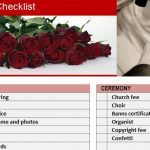 As stated above, the Wedding Checklist is a simple Word checklist in which you will write the important milestones of your wedding and have a method for ensuring those tasks are complete. The first thing you need to do is go through the lists and change any items that don’t fit your wedding and make them into items that do. 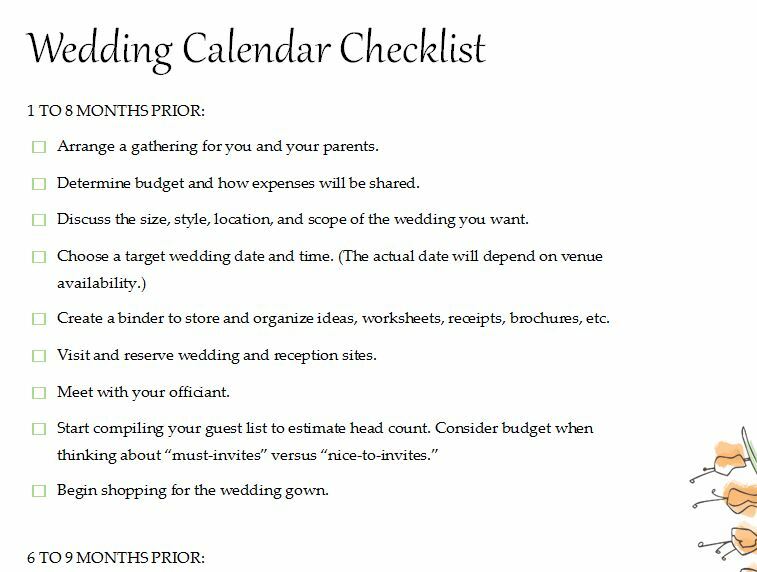 For examples, if you want to plan out the venue first, you can make your goal “Reserve Venue” in the first “1 to 8 months prior” section of the Calendar Wedding template. Remember, this is a simple word document so all you need to do is highlight an example you need to change and write something new. As with any great checklist, a task is never truly complete until you have applied the satisfying pen-stroke in the checkbox to the left of the item. You can either print your list or keep everything digital. If you do want to print the document after you’ve finished entering all the proper tasks, simply click “File” then “Print” at the top of your screen. Make your wedding the picturesque vision you’ve been dreaming of by downloading this free Calendar Wedding template today.